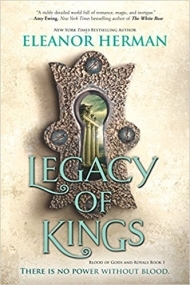 Legacy of Kings was not a bad book per se, but I found it a confusing, frequently boring one. Perhaps I had high expectations for this novel – hello, it’s about Alexander the Great – and those expectations were just not met. Or maybe this book just wasn’t worth the hype. Legacy of Kings is a magical fantasy novel full of myth and history. I picked this book up because it’s about Alexander the Great in his formative years, which should seem like a fun adventure story, right? Wrong. My first issue with the novel was the ridiculous amount of POV characters: seven. My friend, that is too many POV characters, this isn’t Game of Thrones where that many characters makes sense. This is only a 400-page novel. I constantly confused the characters and couldn’t remember whose chapter I was reading, because some of them did just not need to have a POV. Of course you can’t have a book about ALEXANDER the Great without the man himself, and thankfully, I really liked his portrayal. Despite the fact that Alex doesn’t actually play a large part in this book (he is continually overshadowed by other characters), he was my favourite character. KAT was … a very annoying character. I wasn’t very interested in her storyline at all, nor her as a person. Her character/personality fluctuated as the storyline demanded, and she always seemed to pop up at the most random times and/or as a deus ex machina. CYN was a very confusing character. I get the feeling that she was intended to be this badass warrior, but she didn’t really do anything? She was akin to an irritating fly that buzzes everywhere and basically annoys everyone. I honestly have no clue as to what her role in the novel was, so please don’t ask. She was just there to cause trouble, but didn’t actually succeed in doing anything. At the beginning of the book, HEPHAESTION was one of my favourite characters. I’ll be honest: there was a part of me that hoped (read: expected) Heph and Alex would be together in a romantic relationship – after all, it’s historical canon. But they weren’t, not even a little bit, and I was really, really annoyed and that feeling kind-of-almost-definiely translated to the novel itself. Now, I fully understand that there is such a thing as creative license, and that an author can do whatever they want with their novel, but listen: Alexander and Hephaestion’s relationship was romantic in nature, which many scholars and historians agree on. Of course, we shouldn’t place our modern understanding of the word ‘romance’ to describe them: they were brothers-in-arms, best friends, lovers – everything that almost every Ancient Greek male solider was with his comrade. If it’s not obvious by now, I take the firm stance that Alexander and Hephaestion were lovers. They were not monogamous lovers – as Ancient Greeks didn’t understand the concept of monogamy – but they were lovers all the same. My issue with Legacy of Kings is that the book doesn’t even mention or touch on this facet of their relationship. Look, Eleanor Herman is well within her rights not to include the romance, but we live in such a heteronormative society, is it so wrong of me to want to see queer representation from a character who is based on a real life person who was almost certainly queer himself? Is it wrong of me to get annoyed by the erasure of real-life queer romance? Do you think I’m over-exaggerating? OLYMPIA was one of the few interesting characters. I was honestly frightened by her POV chapters, and wanted to read more from her to discover just what the hell was happening. She was definitely one of the few female villains who is genuinely scary, and I sort of want to read the other books just for her, but ultimately she was not a strong enough character for me to invest my time in the remaining two books. ZO … had nothing at all to do with the storyline. I struggle to understand her importance to the storyline and the only thing I can come up with is that she was there to add extra pages to the novel. JACOB was a little sweetheart, and I really liked his character. Like every single other character, he doesn’t really have anything to do with the main storyline and kind of goes off on his own adventure, but Herman gets props because he was cute. I read a review of this book a while ago (I can’t find it now!) but the reviewer had summed up my issue with this novel in one sentence: too much happens in this book, and at the same time not enough happens. That is the most accurate description of this book. Herman shoves all this information and all these characters in our faces but the plot doesn’t develop. Instead, the characters have small adventures on their own, occasionally meet up/save other characters, come together to defeat the random bad guys who show up 3/4 of the way into the novel, and then the book ends with all of these loose ends and I’m left wondering what happened: a lot … but actually nothing. The writing was actually quite lovely. Herman is a great writer and her prose perfectly encapsulating the mystical tone of the book. I was honestly swept away by some of her sentences. Sometimes with a slow book, the author’s writing can make me forget about the slow-moving plot and I can fully immerse myself in the story, but that wasn’t the case here. Herman’s writing really wasn’t enough to make me forget about the lack of plot progress or the annoying characters. Legacy of Kings has quite a few high ratings from reviewers I trust and I am a little gobsmacked by that fact. Did we read the same book? It looks likes that many reviewers had the same issues with me, but they were able to disassociate themselves from the problems. I couldn’t.